After downloaded free theme or purchased, you can choose either of the approaches given below to install your theme. Click Browse Locate clean-biz.zip Theme in your computer. Select clean-biz.zip and click Install Now. Unzip clean-biz.zip to your Desktop. Using an FTP client to access your host web server, go to /wp-content/themes/ and upload your new copy of Clean-biz Theme. After you have created and published the pages, Please navigate to “Customize => Static Front Page” in Appearance. Then set a page (e.g. Front Page) as “Front page” and another page (e.g. 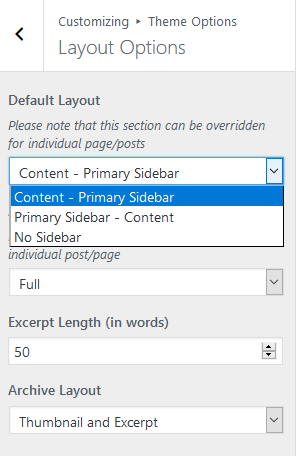 Blog) as “Posts page” and save your settings. How to Hide Front Page Content in Home Page? Site Title: Enable site title of the site. tagline: Enable tagline (i.e. Description) of the site. Just below site title. Logo: Add/Change logo of the site. 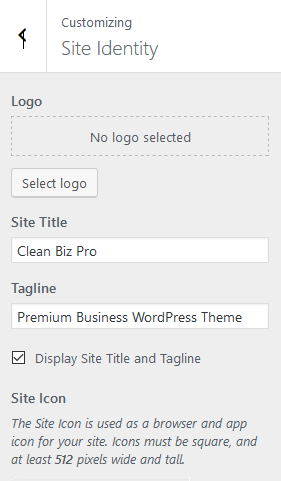 If you do not have a logo: You can enable/disable title and tagline. 1. 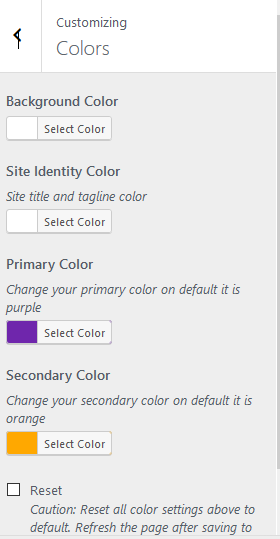 From “Customize” section, go to Colors. 2. From Colors, you will be able to change colors. 1. 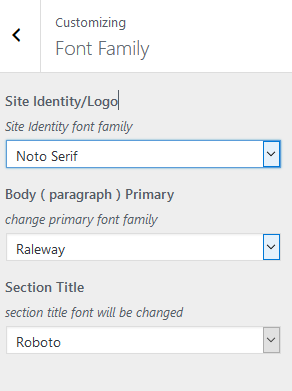 From “Customize” section, go to Font Setting. 2. From Font Setting, you will be able to change font families of different sections. 2. From Background Image, you will be able to change the background image. a) From Customize section, go to Menus. 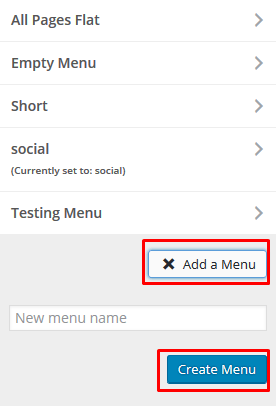 b) From Menus, click “Add a menu” button and you will be able to create a menu. c) Assign Menu location to the created menu. a) From Customize section, go to Widgets. b) From Widgets, you will able to add four footer widgets in Premium version. a) From Customize section, go to Home/Front Featured Slider. b) From Home/Front Featured Slider, you will be able to select various options. 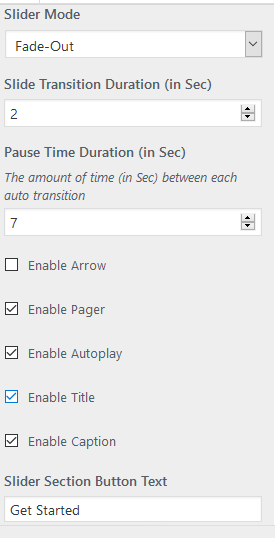 At first you have to check Enable Slider On from Slider Enable Options section. 1. 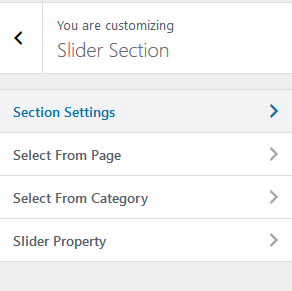 From “Customize” section, go to Home/ Slider and inside that option there is Enable slider section. 2. Check the checkbox and slider will be enabled. You will able to choose slider by creating page or category. In Premium Version you will able to add six sliders. 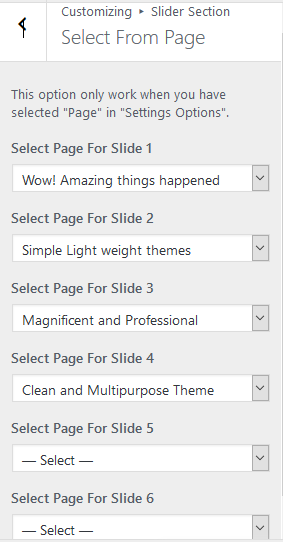 But in In free Version only three slider options. 1. 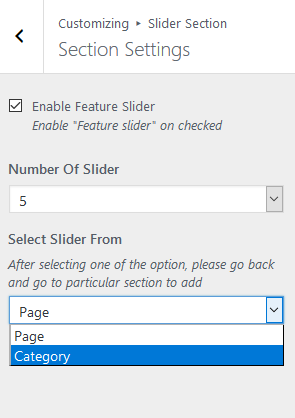 From “Customize” section, go to Slider and inside that option there is Slider Section Select From Page section. 2. You will choose pages one by one. 1. From “Customize” section, go to Home/Front Featured Slider and inside that option there is Select Slider From Category section. 2. 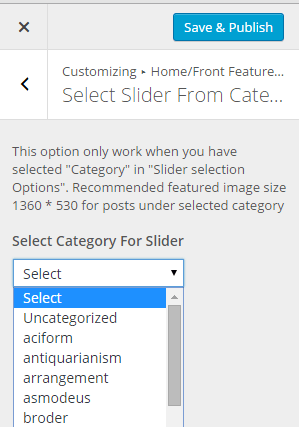 Now, select the category from which the featured image of the posts assigned to that category will be fetched as slider. 1. From “Customize” section, go to Home/Front Featured Slider and inside that option there is Slider Options section. 2. Configure the settings inside that option for slider. 3. If preview is fine then save it. a) From Customize section, go to Service Section . b) From Service Section, you will be able to select various options. At first you have to check Enable Service from Service Enable Options section. Service Selection Options: Select either Page or Category options. After selecting one of the option, please go back and go to particular section to add. Service Number Options: Choose the number of service to appear on your homepage. You can choose 1 to 6 number of service/s. 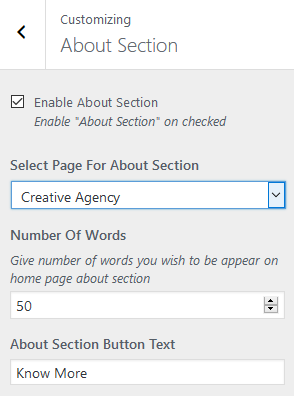 Select Service From Page: Select Pages for service from 1 to 6. You can use font awesome icon: Eg: fa-desktop. You can get the icons from http://fontawesome.io/cheatsheet/ This option only work when you have selected “Page” in “Service selection Options”. Recommended featured image size 1360 * 530 for selected pages. 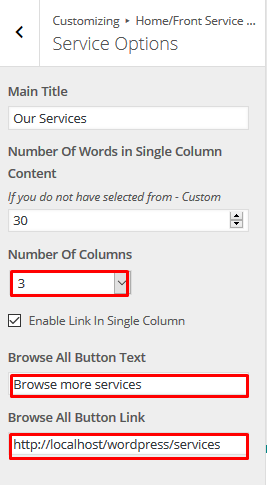 Service Options: You can set options for title, choose number of columns and Browse button text with link here. a) From Customize section, go to About Section . b) From About Section, you will be able to select various options. At first you have to check Enable About to enable this section from About Enable Options section. Select Page For About Section: Where you will able to choose page for this section. Number Of Words: Can be increase/decrease numbers of words. About Section Button Text: Text word is change in Premium Version. a) From Customize section, go to Portfolio Section . b) From Portfolio Section , you will be able to select various options. 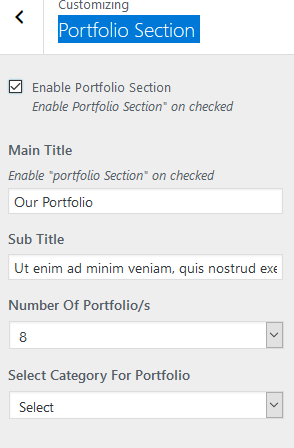 At first you have to check Enable About to enable this section from Enable Portfolio Options section. Main Title: you will be able to change main section title. Number Of Portfolio/s: Choose the number of Portfolio to appear on your homepage. You can choose 1 to 12 number of Portfolio. Select Category For Portfolio: you have to create category and choose. which will display in this section. a) From Customize section, go to Testimonial Section . b) From Testimonial Section, you will be able to select various options. 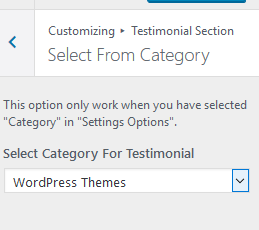 At first you have to check Enable Testimonial to enable this section from Testimonial Enable Options section. Testimonial Selection Options: Select either Page or Category options. After selecting one of the option, please go back and go to particular section to add. Testimonial Number Options: Choose the number of Testimonial to appear on your homepage. You can choose 1 to 6 testimonials. Select Testimonial From Page: Select Page(s) for Testimonial from 1 to 6. Testimonial Options: You can set number of words for single testimonial here. 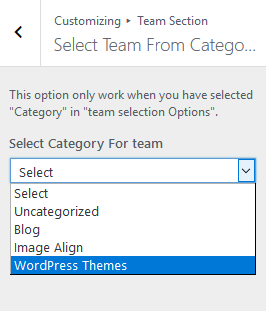 a) From Customize section, go to Team Section . Select either Page or Category options. After selecting one of the option, please go back and go to particular section to add. From Customize section, go to Callback Section. Callback Section Button Text: You will able to change Button Text. Callback Section Button URL: Add button url. 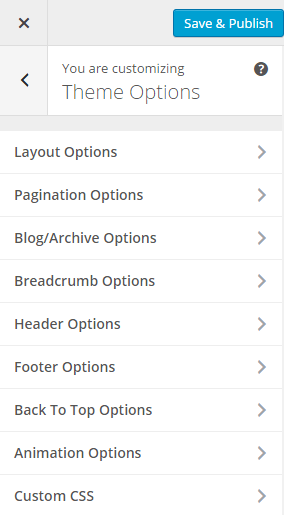 a) From Customize section, go to Blog Options . 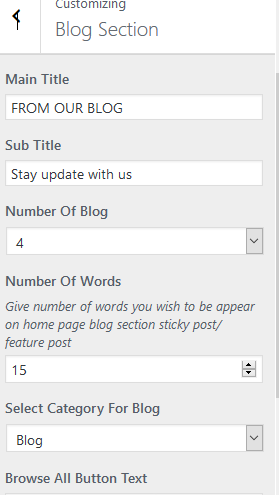 b) From Blog Options , you will be able to write main title, choose number of blogs and columns and Browse button with text and link. At first you have to check Enable Blog to enable this section. 1. 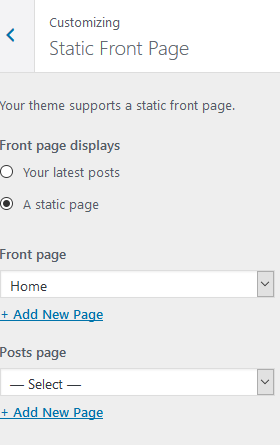 From “Customize” section, go to Theme Options. 2. Now, here you have different sections and settings for Layout, Pagination, Archives, Header, Footer, Breadcrumb, Animation and Custom CSS. 1. From “Customize” section, go to Theme Options and inside it there is Layout Options. 2. 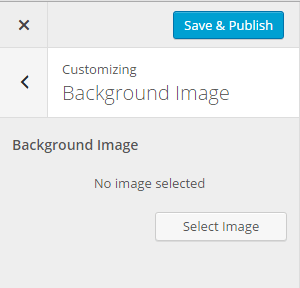 Now, here you can set layouts for Default Banner Image, Default Layout, Archive Layout, Archive Image Alignment, Alignment of Image in Single Post/Page. 2. 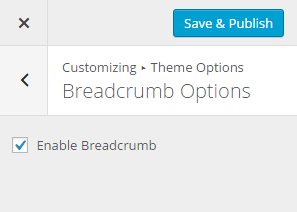 Now, here you can Enable Breadcrumb by checking the checkbox. 2. Now, here you can Number of Sidebars in Footer Area, Copyright Text, Enable Social, Enable Theme Name and Powered By Text. Changing copy write text option is only available in premium version. 1. From “Customize” section, go to Theme Options and inside it there is Custom CSS. 2. 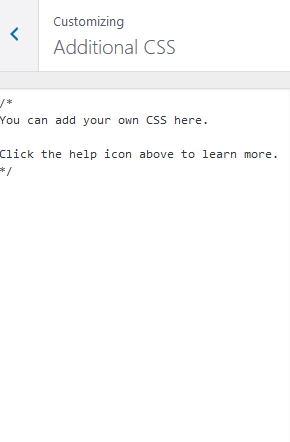 Now, here you can add Custom CSS. 1.we are available in live chat. >when you mailing, please explain issue and share site url with its admin login details.